Hi, my name is Alan, and I am not a script kiddy brat from Xbox Live asking you how to boot someone offline for being mean to me. I am an amateur white hat hacker hoping to learn and teach and this is my first tutorial. Today ,we will be focusing on brute forcing email, or more specifically, SMTP, also known as the Simple Mail Transfer Protocol. It is your standard protocol for sending electronic mail. 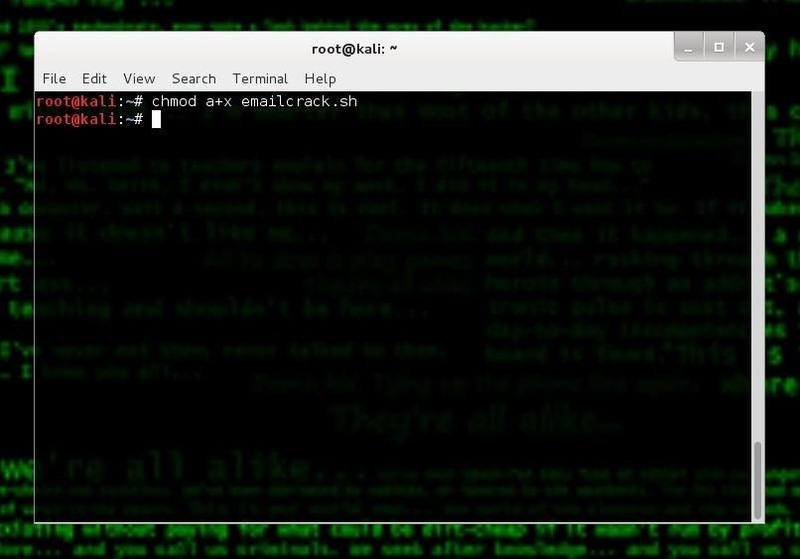 Step 1: Open Up Kali! Of course, we will be using Kali Linux. I use mine on VMware Workstation, but it won't really matter what you use. Let's open up Leafpad, or your text editing program of your choice. We're going to write a little bit of script, so that we can save some time instead of going through the hassle of actually typing out parameters. echo NOTE: Make sure you have wordlists! And after you got it, save it as anything you want, but with .sh at the end. Make sure it is in the root directory. Not on your desktop, but in /root. Now, I am going to explain how the script works. #! /bin/bash simply means that everything is in bash. echo simply means to tell the computer to say something. For example, echo Hello World means to tell the computer to output Hello World. read is asking for user input. this will then store your input into a variable. read email would mean for you to enter something, and it will be stored into the email. 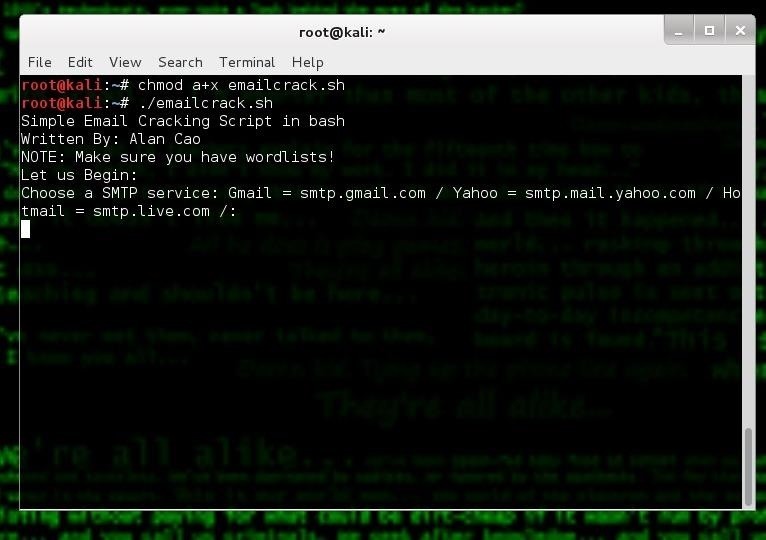 hydra -S -l $email -P $wordlist -e ns -V -s 465 $smtp smtp is the THC Hydra command which will help brute-force the email address. As you may tell, there are some parameters with a $. This is the variable with stored values you previously input in the read command. We're not done yet! The file you have saved (in root, right?) only has read and write permissions. This means you cannot execute it. Now we can finally use it! Have you tested it successfully against gmail? Also, THC-Hydra requires that you provide it with the failure message/string. Have you included it here? Wouldn't Google block your IP when you do so many requests? Yes, usually after 150 failed attemps. Yes, if you have a 150-word or less dictionary. Maybe work on adding form parameters next. Very nice and very well explained. 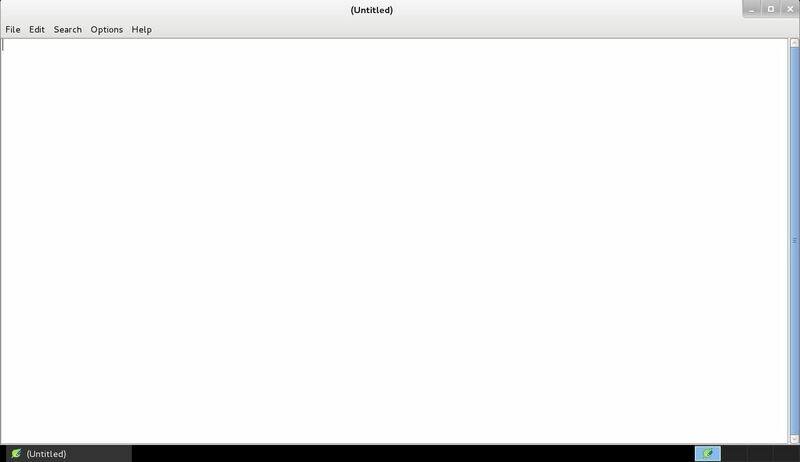 When I enter the password.txt file THAT I SAVED IN ROOT i get "PERMISSION DENIED" anyone know why? When you saved the password list, you must give yourself permissions to use it. Thank you. I gave permission and got it too work but it went right past the real password (I tried it on my own gmail). It was super fast though. I noticed there is no denial string. Has anyone else had this problem? could you hack me my own mail id that i forgotten my password. It says that 1 valid password found. But how do I know what the actual password among the words in the wordlist is?. There are many ways. You can hook the browser with BeEF or exploit the system with Metasploit. Spend some time on Null Byte and you will find many ways. Hi, I'm pretty new at this, when I try to run the script nothing happens, also if i try to run hydra command line outside of bash script it thinks its a non existent directory, any ideas? OK. Can you attach a screenshot of your command? I need more info. The script and a screenshot of your system when you run it. Using hydra command, it wasn't able to find match the password to the username even though it was in there. I'm pretty sure it was because I was running 32 threads. So I just set threads at 4 to see what happens. now google have added new security feature that notifies when somone attack. i tried my simple python cracker on my email but it failed. so i obviously tested it out on my own email and it came back with a false positive? the "valid" password was not correct ? There is any good solution for this problem? The output result i got using termux was kinda strange can u explain please password: ????*???????????UTQUQs;?&??I?? ?